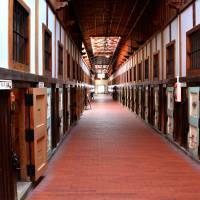 Cold storage: One wing of Abashiri's radial, five-winged prison. Built in 1912, it remained in use until 1984 and is now a registered cultural property. | ETHAN SALTER. I’m transported to those great maps of childhood with dragons rearing from the seas at the edge of the world. 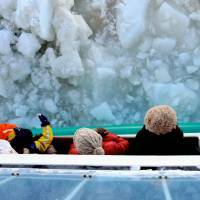 Bobbing in great chunks, the ice floes touch off the wonder of imagination, and I cast my eyes toward the horizon, where ice fields mark the beginning of a trail extending right up to the North Pole. 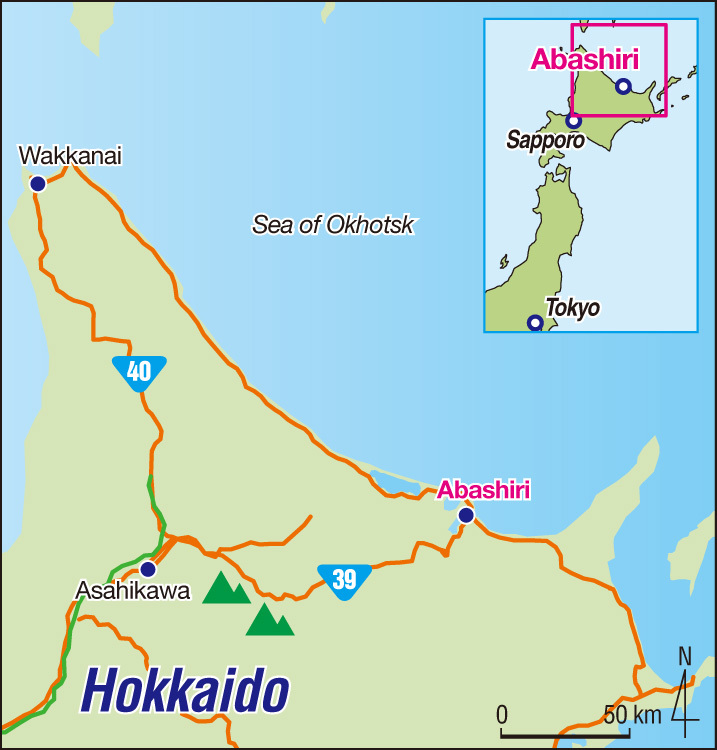 Abashiri is not the coldest place in Hokkaido — that distinction goes to Asahikawa, which recorded Japan’s record of minus 41 degrees, on Jan. 25, 1902 — yet the shores of Sea of Okhotsk in this region of the North Pacific are the southernmost place in the northern hemisphere where the ocean freezes, thanks in part to the great Amur River. After rising in Siberia and forming the border between Russia and China for 1,000 km, this mighty flow debouches into the sea between Russia’s mainland and the island of Sakhalin. 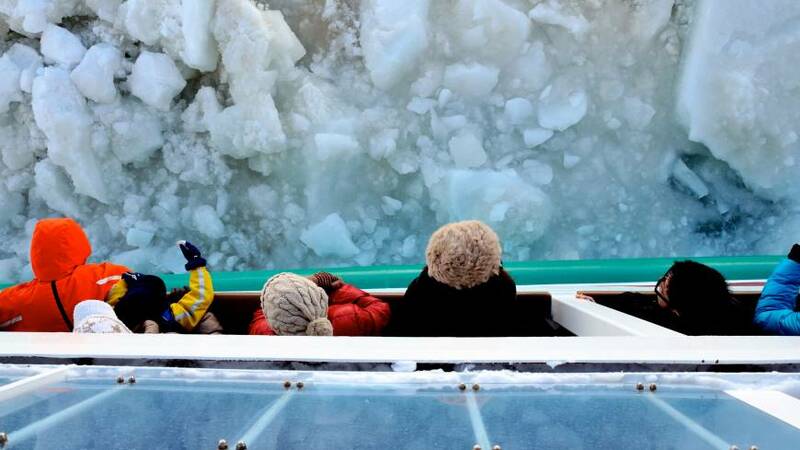 The fresh water means the sea doesn’t have to be as cold as if it were pure seawater before it freezes, resulting in the massed ranks of ice floes that are carried on currents toward Abashiri each year. We were lucky. The morning of our scheduled boarding and the sky bloomed cerulean, framing the mountains across the sea. As we drove along the coast towards port — where a large building marked with the Japanese for “Road to the Drift-Ice” stood — we could clearly see white shelves floating in the distance. Friends had warned that the presence, or not, of the floes depends on mercurial tides — and as we could only spend one day there, we had worried we might miss their splendor. When we arrived, the Aurora II was full of excited tourists pointing toward the glistening white, incontrovertible evidence of floes in the distance. Seagulls dive-bombed as we waited, raucously demanding tid-bits — even as a message from the ship’s loudspeaker advised us in Japanese, English, Korean and Chinese not to feed them. Though the birds didn’t desert us, we were soon on our way, and within 10 minutes we saw our first drift-ice up close; five minutes later and pristine slabs had encircled the ship. We stood in awe, close to the bow to better hear the grinding, melancholy crush and rending of the ice as the ship breaks through. No wildlife materialized for us, but according to the guide, Arctic Foxes, seals and Steller’s Sea Eagles sometimes show. The one animal that surrounded us at all times remained unseen: minuscule Cliones. Also called “sea angels,” these creatures are actually small, floating sea slugs, but their distinctive winged silvery bodies and red “heart spots” have made them a favorite whimsical emblem of northern Hokkaido. Although our entire voyage on the good ship Aurora II was a little over an hour long, as we returned to the dock time felt both eternal and inconsequential; our minds still spinning with the simple beauty of a frozen sea, we drove away from nature’s winter elegance to the brutal reality of mankind and frontier life: Abashiri Prison. 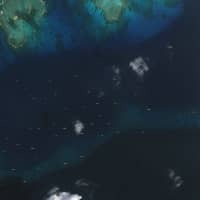 Just 120 years ago, Czarist Russians were still roaming the nearby Shiretoko Peninsula just across the Nemuro Strait, and since Hokkaido had been officially incorporated into Japan following the Meiji Restoration in 1868, the new government urgently wanted to secure its wild northern frontier island to prevent Russia doing just that instead. 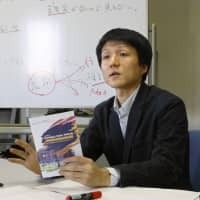 Hence it became imperative that a road was built to link the island’s north with the more settled southern areas of Sapporo and Asahikawa — and it was the task of those prisoners shipped to Abashiri to break through 228 km of rolling wilderness. 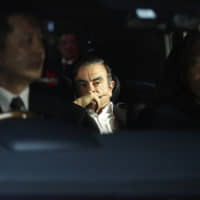 No sooner had they started work, though, than the murder of a visiting Russian prince in Shiga Prefecture sparked fears of an imminent Russian attack and the construction pace became horrifyingly cruel. Frequently working from dawn to past nightfall, and with only four to five hours of sleep per night, as many as eight prisoners died per day. Yet government officials pushed the men relentlessly to finish before the first snowfall in December 1890. Men were buried where they fell, and many monuments known as kusarizuka (mounds of chains) were later erected in memory of their sacrifice. 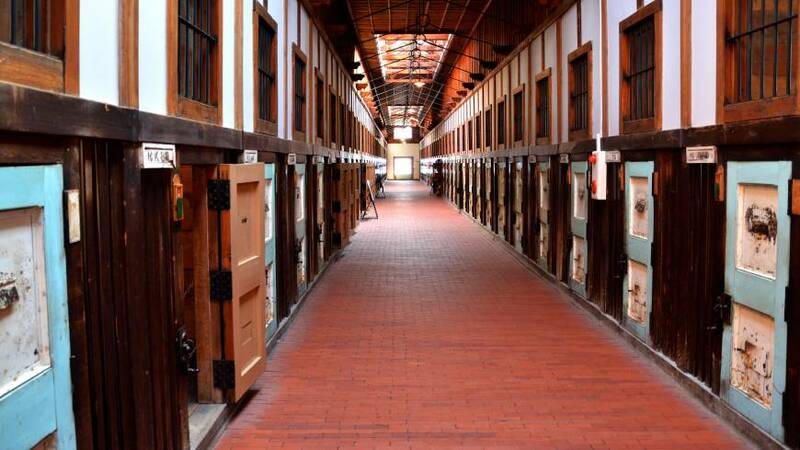 Abashiri later became well-known for its reform into a self-sufficient farming prison, providing a model for such institutions throughout Japan. However, real fame arrived in the 1960s with “Abashiri Bangaichi,” a popular movie series starring a young Ken Takakura. 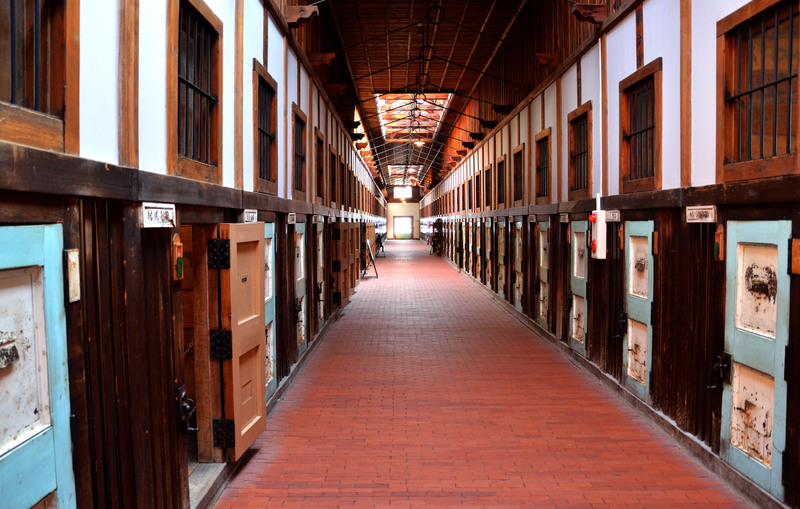 When the prison was relocated to a nearby modern, maximum-security facility in 1984, the old buildings were converted into Japan’s first and only prison museum. Its sprawling outdoor compound features the original 19th-century buildings, including the administration block, the guards hut and the radial, five-winged prison itself. It is a fascinating, if depressing, look into history, and the many exhibitions included English and Korean translations. To lighten our moods, we stopped off at two more tourist sites. First, the Hokkaido Museum of Northern Peoples, whose computerized information kiosks in Japanese and English allowed us to experience a lost way of life and marvel at those hardy peoples’ beauty and strength. We thrilled at their warm patterned clothing, their delicately carved functional wares — and at the way children were loved but never pampered. We watched videos of a toddler practicing paddling in a landed kayak, ending by throwing a child-size harpoon with intense accuracy. That these people had to kill bears and seals — and great numbers of salmon — dispelled any romantic illusions we may have had, but left us awestruck at their ability to survive and thrive in these inhospitable parts. Just down the road, we ended our day with the sunset spectacle from Mount Tento Observatory, offering a panoramic view of Abashiri and the Sea of Okhotsk. 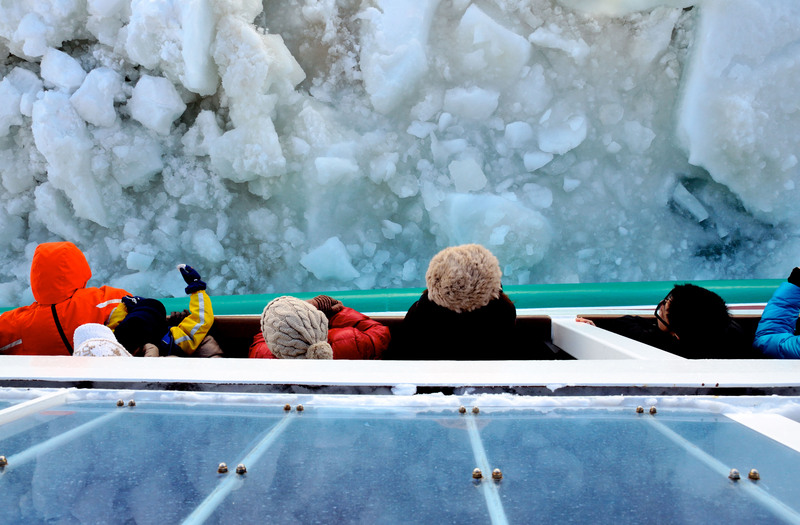 An added bonus was the tubing course outside the adjascent Ice-Floes Museum, which allowed unlimited slides down the slope included in the ticket price. Like anywhere in Hokkaido, Abashiri food delights. The seafood amazes, with crab fried rice a local specialty that went well with Abashiri’s own Blue Beer named after the drift-ice. The downtown area is charming and intimate, and we enjoyed pacing the streets for local hang-outs. Later, as we drove out of town — whose center is a charming warren — we admired the many colorful tents of ice-fishermen on Lake Abashiri, spied eagles wheeling and saw so many deer and foxes as to lose count. With sadness, too, we noticed many gray stone memorials for the prisoners — prompting me often to close my eyes and let the grace of the drift-ice float before me, a soft reminder of the world’s beauty as well. 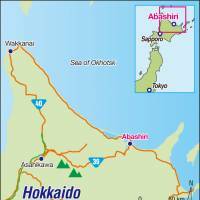 Getting there: All major cities in Japan have flights to Memanbetsu Airport, where you can rent a car for the 20 km drive to Abashiri. In town, local buses serve all the sites of interest. 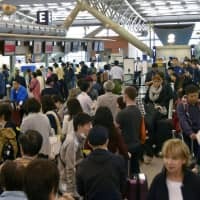 From Sapporo, for those not driving their own or a rented car, there are frequent train or bus connections.